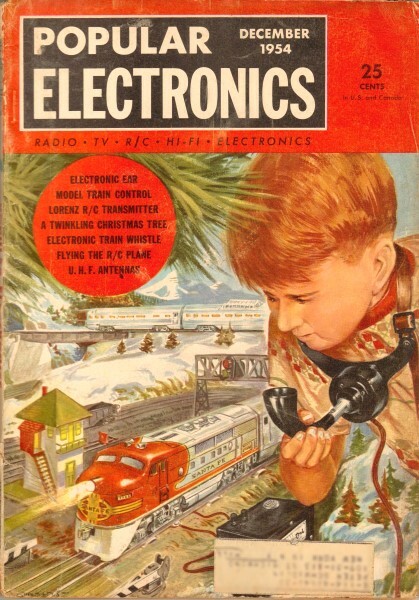 I purchased a couple batched of vintage Popular Electronics magazines off of eBay for use on my engineering website, RF Cafe; however, upon scanning through the pages I was pleasantly surprised to find that many articles on radio controlled airplanes were included. The 1950s and 1960s were relatively early in the R/C sport, and such things were still considered a novelty. 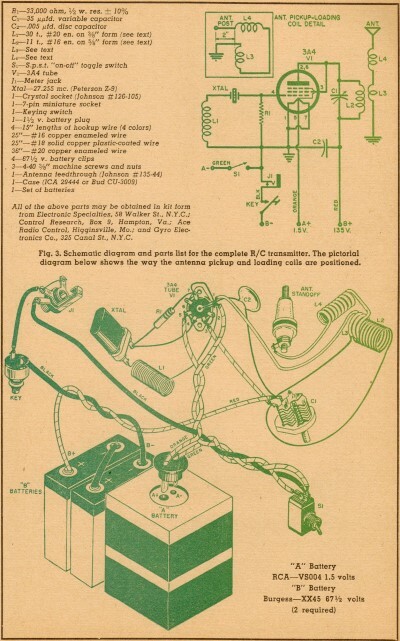 This article is from the December 1954 edition of Popular Electronics, written by E. J. Lorentz about his transmitter design. It used a single 3A4 vacuum tube. 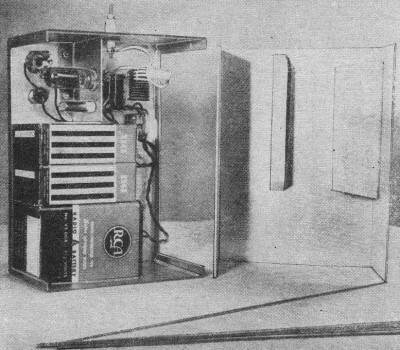 As was the technique of the day, point-to-point wiring was used in the chassis; printed circuits boards were yet to become ubiquitous. Of course all the components are leaded, since surface mount packages did not become common place until the late 1980s. The good thing about those methods is that just about anyone with a soldering iron could build the circuits. Have you ever tried attaching an 0602 SM resistor to a PCB? The Citizens bands include 27.255 mc. and 465 mc. The only type of transmitter which the radio-control fan may build, if he is not a "ham," is one whereby the frequency is crystal controlled. Since this is rather difficult on the 465-mc. band, we must be content to do our building in the 27-mc. band. Read this construction article carefully, and study the diagram and photographs before starting work. First of all, the chassis should be cut, drilled, and bent from .040-inch, 1/2 hard aluminum, or equivalent, as in Fig. 1. Next, the case, which is a 3-1/2" x 6" x 8" "Minibox," has its cover drilled according to Fig. 2. 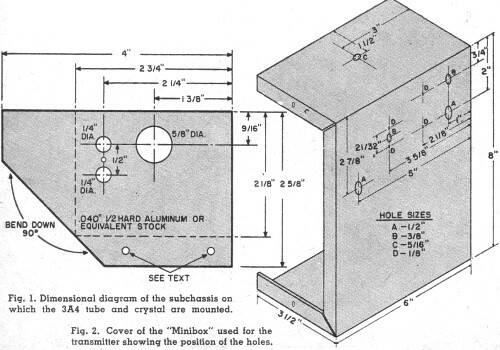 The chassis holes on the bottom flange, shown in Fig. 1, should be drilled after the front cover holes are drilled. Hold the chassis against the cover and mark holes on the flange as per front cover holes. Mount the tube and crystal socket on the chassis before bolting the chassis to the cover with 4-40 3/8" machine screws. Mount the antenna feedthrough, the 35- μμfd. 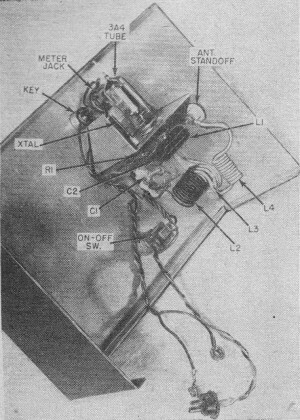 variable capacitor, the "on-off" switch, meter jack, and keying switch as shown. Wind coil L1 (see Fig. 3) according to the parts list, leaving leads about 1/2" long. Be sure the winding is tight and the turns fit tightly against each other. After remov­ing the coil from the form, give it a coat of clear nail polish. Wind the tank coil, L2, as specified in the parts list, leaving the leads about 3/8" long. Space the turns evenly, after winding, until the length of the coil is 1". The antenna and loading coils, L3 and L4 are made from a 24" length of #18 solid plastic-coated wire. Leave 1-1/4 to 1-1/2 inches between the two windings. L3 consists of 3 turns wound on a 3/8" diameter form; L4 is 10 turns close-wound on a 3/8" diameter form. We are now ready for final assembly. Follow the schematic in Fig. 4. Although not imperative, it is desirable to have four color-coded wires for hookup. The colors used are: black for "B-," red for "B+,"· green for "A-," and orange for "A+." About 15" of each are used. Solder the "A+" filament wire to pin 5 of the socket. (Remember that all socket connections refer to the underside of the socket.) The "A-" wire is soldered to pins 1 and 7 and also to the center eyelet of the socket. Twist the "A+" and "A-" wires together for about 3 inches, cut the "A-" lead and solder it to one side of the single-pole, single-throw switch. The other piece of "A-" lead is soldered to the other side of the switch. Now twist the "A-" and "A+" leads together again for about 6 to 7 inches, then cut, and solder to the "A" battery plug. The large pin on the plug goes to "A+." Place the tube in the socket and check to see that the filaments light when the switch is turned on. Solder coil L1 between the ground point at pins 1 and 7 and the outside crystal socket terminal. Resistor R1 is soldered between pins 1 and 7 on the tube socket and the inside crystal terminal. Extend the resistor lead from the crystal socket to pin 4 of the tube socket and solder. The .005-μfd. plate bypass capacitor, C2, is sol­dered between the ground point and the rotor (movable plates) terminal of the 35- μμfd. variable capacitor, C1. Solder the tank coil, L2, between the rotor and stator (fixed plates) terminals of the 35-μμfd. variable capacitor. Solder a short piece of wire between the stator end of the coil and pins 2 and 3 of the tube socket. This completes the basic oscillator. Before starting the final hookup, be sure the meter jack is insulated, by means of insulated washers, from the case cover. Use a short piece of black wire to connect one of the sleeve terminals of the jack to one side of the keying switch. Connect the two jack sleeve terminals together. Another short length of black wire is soldered between the other jack terminal and the "on" side of the "on-off" switch. The "B-" black lead is soldered to the remaining terminal of the keying switch. A 6- to 8-inch length of red wire is soldered to the junction of the tank coil, L2, and the .005 μμfd. capacitor. Twist the black and red leads together, cut, and attach battery clips. Now insert the tube and crystal in their respective sockets and attach a 0-25 or 0-50 milliampere d.c. meter to a meter-jack plug and insert in the meter jack. Be sure the polarity is correct-the plus terminal of the meter going to the side of the jack connected to the "on-off" switch. To tune the transmitter, turn the switch on and set the variable capacitor to minimum, or until the plates are unmeshed. Depressing the key will give a current reading of 25 milliamperes or more. Rotate the variable capacitor until the current drops sharply to about 5 to 6 milliamperes. This indicates that the oscillator is functioning properly. Failure to obtain a current drop indicates an incomplete connection or a short to ground through the meter jack. Next, install the antenna coil by inserting the three turns of L3 between the turns of L2 near the plate end of the coil. Insert L3 only about two-thirds of the way into the tank coil. The free end of L3 is sol­dered to the ground connection of the tube socket, and the free end of L4 is soldered to the antenna post lug. Upon depressing the key, the variable capacitor will have to be readjusted to give a minimum reading, which will, be about 2 milliamperes more than that obtained with the coils not in place. After the minimum reading is obtained, set the variable capacitor to obtain a current rise of about 1 to 2 milliamperes. For bench testing, your transmitter will now operate the receiver in last month's issue of POPULAR ELECTRONICS. Note the two wood blocks screwed onto the bottom portion of the "Minibox" as seen in the photo on page 53. These blocks serve to hold the "A" and "B" batteries in place and should be added to the transmitter case after it has been completely assembled. Use a grade of soft wood for this purpose. The center strip is about five inches long and one inch wide. It is so placed as to press down on the batteries and hold them in place. The other block is also about five inches long but is 2-1/4 inches wide. This screws onto the side of the case and hits up against the end of the batteries keeping them from sliding across the transmitter.